Some times back I had reviewed uRex Free Video Converter. I found that application quite useful and comprehensive even in the free version. uRex Video Converter Platinum is the paid version and comes with support for Apple Devices, New iPad, iPod, Apple TV, Tablets, Kindle Fire, Xoom, Galaxy, Nook etc. uRex Video Converter Platinum also supports Nokia, Samasung, HTC, Moto smart phones. HD video output, NTSC, PAL, SECAM TV Videos are supported in this paid upgrade. 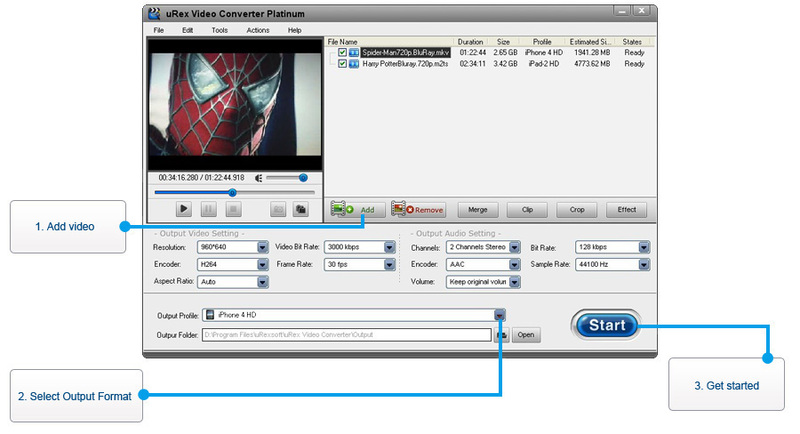 With uRex Video Converter Platinum you can download videos from Youtube, Facebook, Yahoo etc. The software offers powerful editing features: Crop, Merge, Split, Effect. CPU priority during software usage can be managed in uRex Video Converter Platinum. It also offer custom defined profiles for video conversion. Video AVI, MP4, DivX, MPEG, H264, WMV, MKV, MOV, VOB, ASF, DV, 3GP, HD VOB, HD MKV, HD TS, HD AVI, HD MPEG, HD MP4, HD ASF, HD WMV, HD MOV. The software is easy to use. With a few click of mouse, you can convert and edit your favorite videos. Step 1. Import videos. Click Add button to load videos from the local. Alternatively, you can go to File–>Add File/Add Folder to add the videos you want to convert. Step 2. Select output formats and destination folder. Select a output format from the “Output Profile” drop-down list as you like. Then select directory from “Output Folder” drop-down list to save the to-be-converted videos. You can also adjust your own resolution, frame rate, audio channels, and bitrates etc. in the Output Video/Audio Settings. Step 3. Start to convert video. After finishing all the necessary settings, you can click to start converting your file. You can preview the conversion progress from the progress bar and stop it as you like. uRex Video Converter Platinum is normally priced at $34.95 for a lifetime license. Evaluation version can be downloaded from the following link. On the occasion of Halloween, uRexsoft is offering uRex Video Converter Platinum as free. You have to download the Zip archive from the link provided there. The archive contains the installer and the license key to activate the product. Please note that it is a special build and will not upgrade. You still can get free support. This offer will end on 6th November.